Some of MADSA's new young leaders. 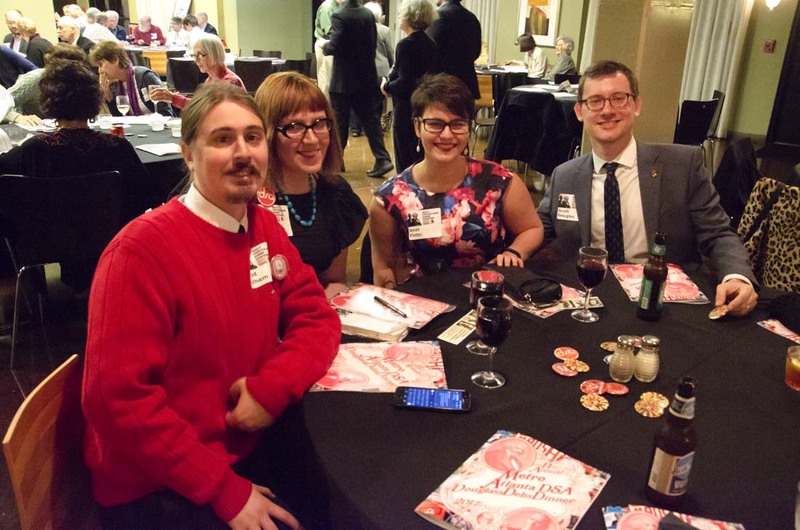 (L to R) Brad Latham, chair of our NE Ga. branch; graphic designer Emma Latham; officer Anat Fintzi; Scott Douglas, co-chair, Education Working Group. At the 2017 Douglass-Debs Dinner, Nov. 18, we packed the Loft at Castleberry Hill with a beautiful celebration of our campaigns for democracy, socialism, and human rights. (Right: The Communication Workers of America’s table.) This was MADSA’s 11th annual fundraiser where we recognize and celebrate the work of progressive leaders in the Metro Atlanta community. Brother Mawuli Davis, founding partner of the Davis Bozeman Law Firm, received an award for his continued work as a true people’s lawyer across so many struggles. Brother khalid kamau, councilman for the new City of Renaissance (aka South Fulton) received an award for his community justice work and help leading the new city just south of Atlanta to a better, more progressive, future. Sister Lani Amina Ledisi accepted the MADSA Creative Activism Award for Southerners on New Ground (SONG) and their Black Mamas Bailout Project. Thanks to Chair Adam Cardo; outgoing Chair, Milton Tambor, who organized this event for the its first 10 years; keynote speaker Sarah Jaffe; all the awardees; the Douglass-Debs Organizing Committee; singer Payton Scott; graphic designers Emma Latham and Barbara Segal; our labor movement supporters; and all members and attendees, for the inspiration we need to continue these difficult struggles into 2018 and beyond. – Daniel Hanley and Lorraine Fontana. Photos: Reid Freeman Jenkins, Shelley Elise Berlin, Lorraine Fontana. Khalid with award presenter and MADSA officer, Teamster Local 728’s Eric Robertson. The Communication Workers of America’s table.